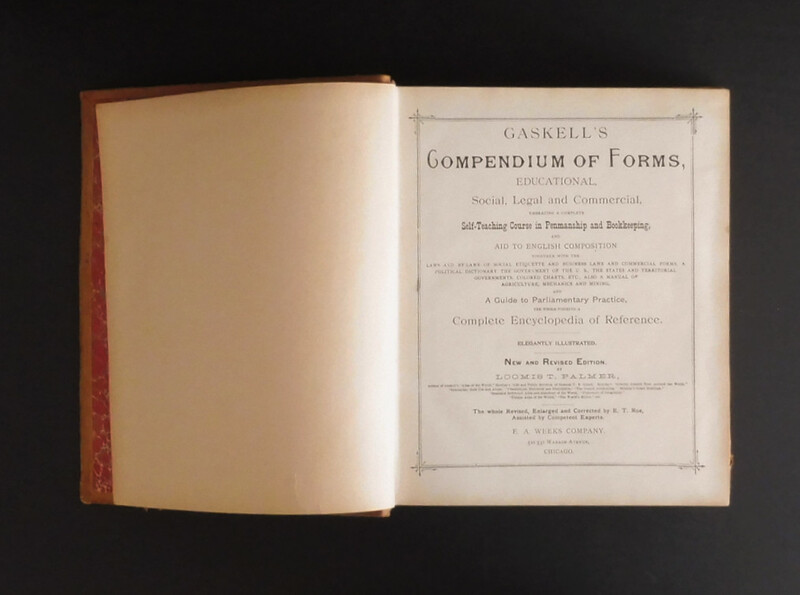 Gaskell’s Compendium of Forms, Educational, Social, Legal and Commercial, Embracing a Complete Self-Teaching Course in Penmanship and Bookkeeping, and Aid to English Composition Together with The Laws And By-Laws Of Social Etiquette And Business Laws And Commercial Forms. A Political Dictionary; The Government of the U.S., The States and Territorial Governments, Colored Charts etc. Also A Manual of Agriculture, Mechanics and Mining. And A Guide To Parliamentary Practice, The Whole Forming A Complete Encyclopedia Of Reference. 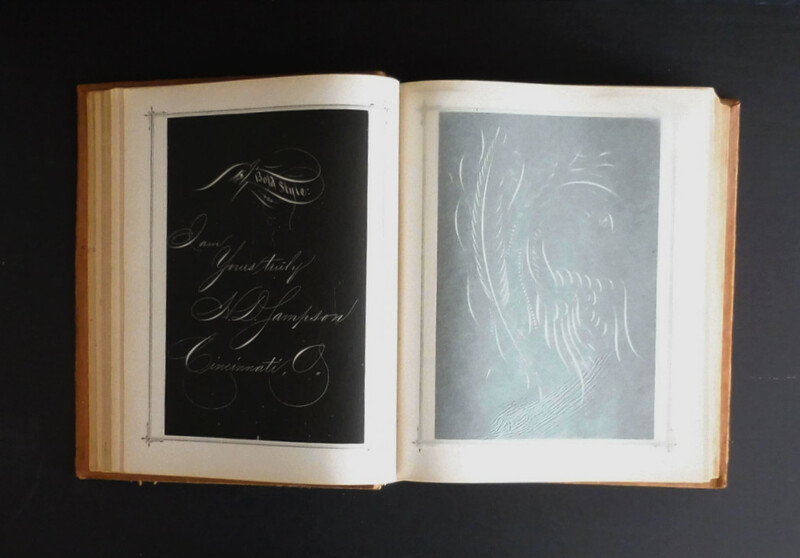 ; Elegantly Illustrated; By Prof. G. A. Gaskell; New and Revised Edition by Loomis T. Palmer. The Whole Revised, Enlarged and Corrected by E.T. Roe, Assisted by Competent Experts. E.A. Weeks Company, 5210531 Wabash Avenue, Chicago. 1897. Tan suede boards with banded spine containing 2 black leather panels with gilt titles; marbled endpapers; black cloth hinges, all edges marbled. 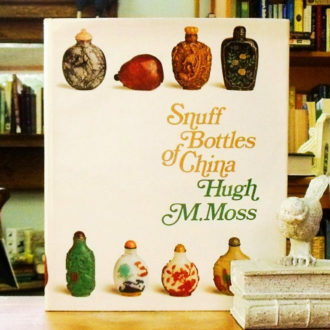 4to up to 12″ tall. Xxvi; Preface, Contents, Indexes; 658 pages; 12 tissue guarded black and white plates illustrating fine examples of penmanship and printing styles; illustrated throughout with full page and in text engravings, tables and sample forms; colored maps and statistical table section. margin and chapter decorations framing text all pages. 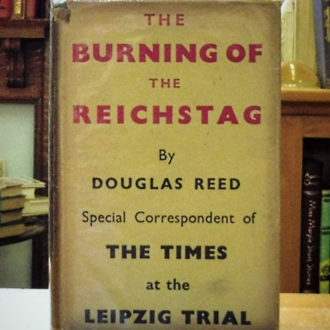 Boards have some soiling and rubbing to suede, Contents are in near fine condition commiserate with age; front decorative endpaper has a tiny (¼ “) circular loss to top layer exposing the white underlay; pages are uniformly browned with an occasional small foxing mark in outside edges; tiny cut to fore-edge of dedication page; one tissue guard is missing. Binding is tight and square and pages are clean without creases. 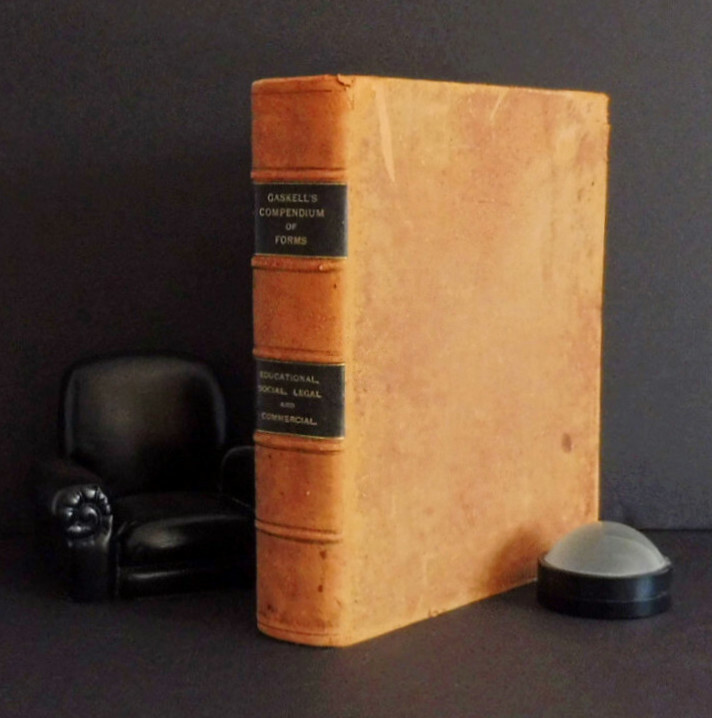 This lovely copy of Gaskell’s Compendium of Forms is a treasure for the collector and or researcher of the late Victorian age in America and abroad. It provides an immense range and detail of topics. For a description of contents please contact me.